Translation: The leader of the residents of AzhwArthirunagari – nammAzhwAr. His thiruvAimozhi which sounds like the sweet tunes of vINA speaks about the most important 5 principles – the true nature of the supreme lord SrIman nArAyaNan (parmaAthma svarUpam), the true nature of the eternal jIvAthmA (jIvAthma svarUpam), the true nature of the most fitting means (upAya svarUpam), the true nature of the hurdles which are in the form of infinite karma (virOdhi svarUpam), the true nature of the ultimate goal (upEya svarUpam). artha panchakam means “Five concepts” (to be understood essentially). piLLai lOkAchAryar have mercifully compiled a divine rahasya grantham (confidential literature) which beautifully brings out these principles named “artha panchakam”. This article is a compilation based on that wonderful grantham. antharyAmithvam – He being the in-dwelling super soul. Two sub-categories – being the in-dwelling super soul inside the AthmA and being the shining form in the heart along with SrI mahAlakshmi. 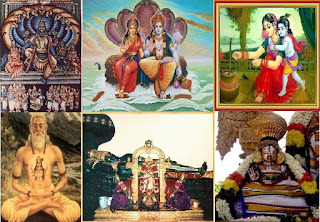 archAvathAram - emperumAn's divine forms in temples, mutts, homes, etc. karma yOgam – Engaging in yagyam (sacrifice), dhAnam (charity), thapa (penance), dhyAna (meditation), etc., which are ordained in SAsthram, acquiring control of senses through such practice, engaging in ashtAnga yOgam, etc., and realizing one's own AthmA (self). This will be ancillary for gyAna yOgam and will be mainly focussed on worldly wealth/control. gyAna yOgam – Using knowledge acquired through karma yOgam, meditating upon bhagavaAn SrIman nArAyaNan who is seated in one's own heart and being in constant contemplation/penance on him. This will be ancillary for bhakthi yOgam and will be mainly focussed on kaivalya mOksham. bhakthi yOgam – With the help of such gyAna yOgam, with constant meditation which leads to blissful experiences, eliminating the accumulated virtues and vices and finally having full understanding about the process and goal and acting upon that. prapaththi – Surrender to bhagavAn which is very enjoyable, easy to follow, that which will bring immediate result, and since it is to be done once, all other actions which are done subsequent to the first surrender become part of service to bhagavAn. This is also most suitable to the nature of those who are incapable of engaging in karma, gyAna, bhakthi yOgams and those who consider it improper to engage in such yOgams (once they realize their true svarUpam as an absolute servant of the Lord and hence any self effort (yogams) at self protection isn't proper for them). There are two sub-categories – namely Artha prapaththi (for those who cannot bear even momentary time in this material realm and wanting to go to parama padham immediately) and dhruptha prapaththi (for those who live in this material realm in total dependence in bhagavAn and continue to engage in service to bhagavAn, bhAgavathas and AchArya in this world until reaching the ultimate destiny in parama padham). AchArya abhimAnam – For those who are incapable of engaging in any of the previously mentioned processes, the most merciful AchArya (spiritual master) himself voluntarily taking care of such individuals, teaching them the essential principles and guiding them fully. The Sishya (disciple) just needs to fully depend on such AchArya and obediently follow him to attain the ultimate goal. Notes: Here we can recollect SrI rAmAnuja as the uththAraka AchArya (saviour who can uplift us from this material world) out of great compassion and ones own AchArya as upakAraka AchArya (preceptor who can lead the surrendered individual to SrI rAmAnuja). Many of our pUrvAchAryas demonstrated this principle of fully being surrendered to the lotus feet of emperumAnAr as the ultimate objective. More on this can be seen in http://ponnadi.blogspot.in/p/charamopaya-nirnayam.html . Our maNavALa mAmunigaL too highlighted in Arththi prabandham that he desires to be like vaduga nambi who was totally surrendered to emperumAnAr. svarUpa virOdhi – Mistaking the body for AthmA, to be a servitor of some one other than bhagavAn and considering oneself to be independent. parathva virOdhi – considering other dhEvathAs as supreme, considering other dhEvathAs at par with bhagavAn, considering such petty dhEvathAs to be powerful, considering incarnations of bhagavAn to be simple humans, considering archA vigraham of emperumAn to be lacking in ability/power. upAya virOdhi – considering other upAyams as great, considering surrender to be too simple to attain the desired results, considering service in parama padham is too great to be acquired (instead of having faith in AchArya/bhagavAn that he will bestow us that) and fearing for the many hurdles (instead of having confidence in AchArya/bhagavAn). prApthi virOdhi – That which stops us from attaining the goal immediately – the relationship with the current body (which will naturally perish upon exhausting the remainder of virtues/vices), heinous crimes, bhagavath apachAram (offenses towards bhagavAn), bhAgvatha apachAram (offenses towards devotees), etc. After acquiring knowledge about these five concepts, mumukshu (one desiring for mOksham) should follow the following life-style – earning within the limits of varNASramam and vaishNava ideals, offering all such earnings to bhagavAn/bhAgavathas and consuming/accepting only as much as required to maintain the body, serving one's AchArya who enlightened the disciple with great dedication and should live to please him. One should manifest humility in front of bhagavAn (thinking about bhagavAn’s greatness), ignorance in front of AchArya (thinking about AchArya’s wisdom), dependence in front of SrIvaishNavas (thinking about their lordship over oneself), differentiation in front of samsAris (thinking that we are totally surrendered and not have material desires like them). One should have craving for the goal, faith in the means/process, fear for the hurdles, detachment and disgust in one’s body, realisation in one’s self, inability in protecting oneself, respect towards bhAgavathas, gratitude and confidence towards AchArya. For one who has such knowledge and puts such knowledge in to practice, he is dearer to emperumAn more than emperumAn’s own divine consorts, nithyasUris and mukthAthmAs.